Choosing velvet furniture is choosing to make a bold style statement in your space—there’s no ignoring its soft sheen, rich color, and innate elegance. But velvet’s commanding presence also means that any discoloration or stains are that much more visible. 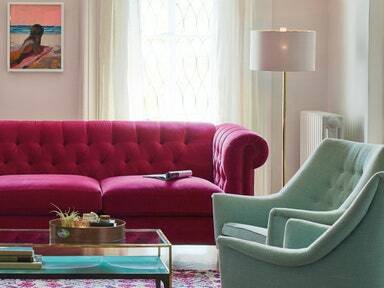 Anthropologie’s website has pages of velvet sofas and chairs to peruse, so who better to ask for advice on how to clean velvet furniture? According to Anne White, the brand’s head of home interiors personal styling, the first thing you should think about is actually completely unrelated to the furniture. “If you’ve opted for a bright, richly pigmented color, like navy or chartreuse, we recommend avoiding direct sunlight, which can cause the fabric to fade,” she says. “Consider window coverings substantial enough to protect your piece but lovely enough to catch the eye. The technology for window films, which block the sun’s rays without blocking your view, has improved and may be another avenue to explore.” Read on to learn how to clean velvet furniture and protect it from wear and tear and those inevitable spills. “Once the velvet is dry, use a soft, dry brush in the direction of the pile to restore its direction and loft,” says White. “It’s best to professionally clean the entire piece to ensure the color remains uniform,” she explains. “To ensure your velvet furniture remains in optimal condition, you should have it professionally cleaned with pure, water-free solvents.” Next up? Sit back, relax, and enjoy your good-as-new upholstery.